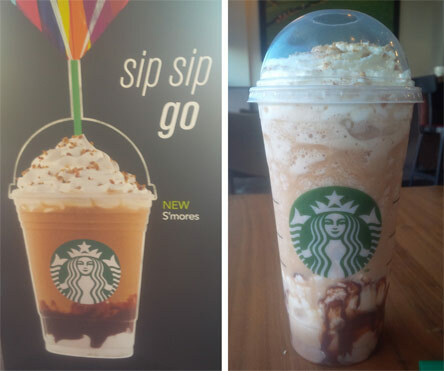 [By Nick, New for 2015, back for 2016] Dubba has reviewed more than a few coolattas so I think it's not a huge stretch for me to review a Starbucks Frappuccino. I mean, it was released today and S'mores is in its name. Time to go be a [person who visits Starbucks often]! I apparently don't know my sizes at Starbucks seeing as I ordered the biggest size. Oh well, this is only the second drink I've ever ordered from Starbucks. And honestly, it's quite tasty. A Frappuccino is about the same consistency as a coolatta with a bit more creaminess to it. It's quite easy to drink and before I knew it I had consumed half my venti. There's really no coffee taste but a strong marshmallow vibe from the whipped cream and syrup taking over. This just taste like a liquefied marshmallow and I'm totally okay with that. The chocolate is an underlying flavor in the background and the graham cracker crumbs add nothing but visual appear. If you love marshmallows like I do, get this drink now. It might not deserve the s'mores name but I consumed 90% of my drink without any trouble. Note: The Impulsive Buy has a review of the bottled version.